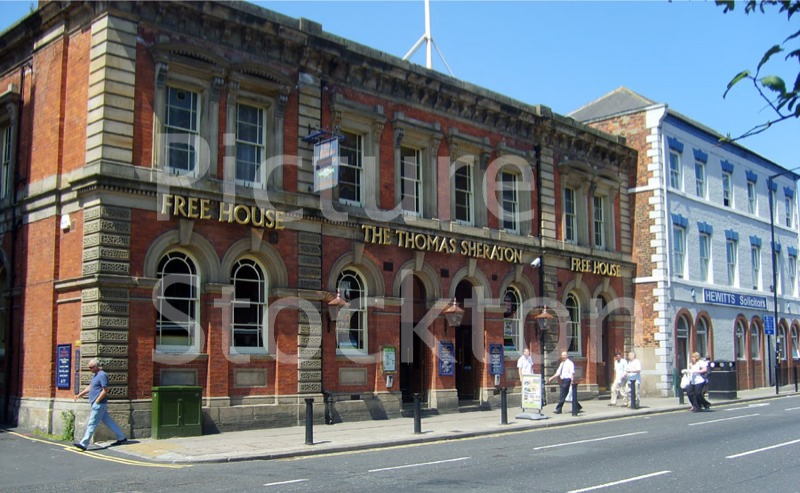 This photograph shows the Thomas Sheraton public house on Bridge Road in June 2009. This entry was posted in Art and Architecture, Misc Buildings, Shopping and Commercial Premises by Picture Stockton Team. Bookmark the permalink. Wasn’t this the Berni Inn? No, the Berni Inn was next door to the left, which was the old Metropole, which is now gone. The Thomas Sheraton was the County Courthouse in it’s heyday. No, went to Sheraton and left in 76. Brothers and sister went to Blakey. I remember getting my adoption certificate from here – circa 1969. I remember it as Stockton County Court, I started work there in 1969. All summons were handwritten in those days in very large ledger books. The first computer used in the court was for the issue of warrants in 1989. It used to have the official receivers at the back of the court, across the courtyard. I was told that the cellar there used to have a tunnel connection right down to the riverside, but was never able to confirm this, maybe someone has more information about this? It had a lovely courtroom too. It was a shame when it finally closed, it must have been the early 1990s… all jurisdiction then went to the Teesside Combined Courts. This is a picture that must hold many memories for Stockton folk, as it is the former Stockton County Court Building, in Bridge Road, Stockton.